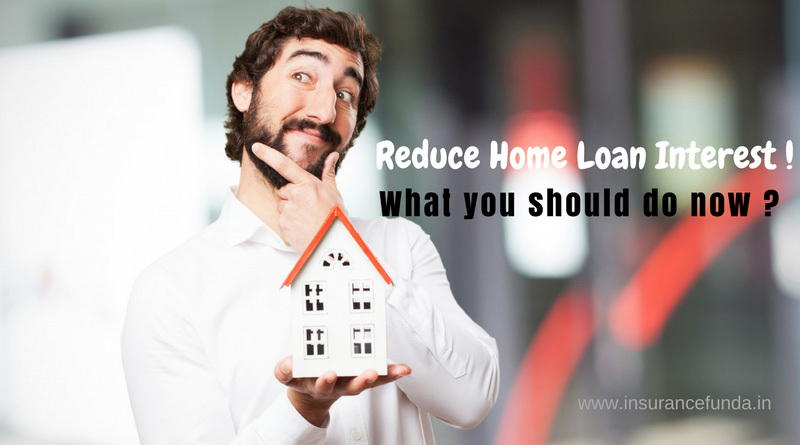 Reduce home loan interest – What you should do now ? Of late, we are in a trend of reducing interest rates. We have seen it’s positive and negative implications in various sectors of life. Naturally, all home loan owners expect to get benefited by this south ward interest rate shift. But in reality this need not happen. Why? let us have a look. Home loan interest rates – How it is regulated? For those who have taken home loans after 1 st July 2010 but before 1 st April 2016, the home loan rates are linked either with the Base Rate (BR) or Retail Prime Lending Rate (RPLR) of the bank. Retail Prime Lending Rate is the lender’s pre-selected, internal rate. The base rates or RPLRs are bound to changes with the changes in the economic scenario. If the Interest rates move upwards, the lender will quickly update the rate. But on the other hand, when the interest rates come down, generally the lender will be too lazy to go for revision of rates. Naturally the benefits due to negative interest rate shifts are not passed to the the loan holders in an expected time frame. Marginal Cost-of-funds based lending rate (MCLR) is a more dynamic method for determining lending rates. As per the Reserve Bank guidelines, all banking institutions are bound to follow MCLR method from 1 st April 2016. To make it simple, MCLR is the bench mark rate, below which, a bank cannot lend and is calculated based on a prescribed formula based on four variables. Down ward change in repo rate will naturally change the MCLR rates down ward. Post demonetisation, as the banks remain cash rich, cost for procuring funds have also come down. And no need to add, banks are forced to reduce MCLR rates faster. Step 1:- Ensure that your home loan is MCLR based. If not, ask for a shift to your home loan provider. One point to remember is that Housing Finance Companies like HDFC and Non Banking finance companies still offer home loans based on RPLR rates. In that case you will have to get contented with what the company offers. Reset period of home loans – What you need to know? Reset period is the minimum period which is required to revise MCLR rate in a particular home loan. Since April 1st 2016, when the MCLR rates were introduced, almost all banks kept the reset period as 12 months. However of-late many banks offer a reset period of 6 months also. Lower Reset period will ensure that benefits on interest rate changes will be passed to you sooner. But the catch in the lower reset period is that, some time banks may offer the 6 month reset period with a marginal interest hike. How to reduce home loan interest, if Loan is with a Non Banking Finance Corporation (NBFC )? As MCLR system does not apply to Non Banking Finance Corporation (NBFC’s), you may feel like lost in a desert if your home loan is from such a company. But good news is that you need not worry that much. Leading NBFC’s like HDFC do not change their RPLR rates that often but they revise another value call ‘Spread’ which is the difference between the RPLR and the actual home loan rate. These companies revise the spread based on the changes in the economic scenario. But one fact which is often overlooked is that, new home loan rates based on revised spread will become applicable only to new loans taken after the revision. Existing home loan users will have to wait for a period to get their interest rates revised. So no need to add that always there will be a lag in your home loan rate compared to the market rate. Again a mater to get disappointed? No, you need not panic as still there is a way out for you through ‘Conversion’. Conversion to reduce Home Loan interest rate – What is it and when to go for it? Conversion is the process of resetting your home loan to the lower rate applicable, before the actual reset date. Then what is the catch in it? Normally, you will have to pay a conversion fee any where around 0.2 – 0.5% of the out standing loan amount to do the conversion. So before jumping for conversion, it is always advisable to go for a cost – benefit analysis on how much you will have to spend and what benefit you will get. Generally, even small changes in interest rate will make big changes in the total out go from your pocket if the outstanding loan tenure is more than 5 years. One point to remember is that often the conversion charges can be waived or reduced at the discretion of the concerned officials. So don’t hesitate for a bargain. Refinance to reduce home loan interest rates – What you need to know. If nothing works out and you still feel that there are greener pastures ahead you can consider refinancing or balance transferring your home loan. Before deciding on the refinancing options it is highly advisable to do a thorough study on all the options available. The tricky part is that, after considering the cost and the efforts involved in refinancing, there is a chance that the new loan may not offer expected benefits. So the choice between Refinancing, Switching, Resetting or converting your home loan depends on the outstanding amount and tenure of your home loan. Even though we cannot expect to get the interest rates lower and lower for ever, it is advisable to look for lower rates as and when it is available.